Lachelle and her six children became homeless after she left her children’s alcoholic father, then was ordered to bed rest while pregnant with her youngest. Forced to quit her job to ensure the healthy delivery of her son, she had to use up all of her savings just to pay day-to-day bills. She left the hospital after giving birth with nowhere to go. 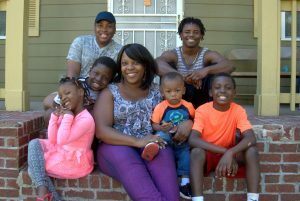 After spending time in shelters that either separated her from her two teenage sons or required her family to move every week, Lachelle found Nicholas House. Lachelle was accepted into our Homeless to Homes program, which allowed her to keep her entire family together while she lived in a rent-subsidized apartment. Working closely with a case manager, Lachelle was able to set aside enough money for a new car, the up-front costs to move to a new home, and an additional $1,000 in savings. In summer of 2016, Lachelle graduated from the Homeless to Homes program and moved her family into a beautiful 4-bedroom rental home. She works full-time at a daycare and is close to completing her Associate’s Degree in Early Childhood Education, with plans to advance her career and increase her salary by working in the county school system. She is saving to buy a house and is thrilled to be back on track and planning for the future. Thanks to Nicholas House programs and Lachelle’s drive to succeed, her family’s future is looking bright! Nicholas House provides an array of housing programs that keep homeless families of any composition intact while they work toward self-sufficiency.